It takes 90 minutes to drive to Nemaska from the turn-off on the James Bay Highway. Following the gravel track that cuts east through the low-standing forest, you pass trappers’ cabins, veer left onto the access road that is marked with an inukshuk, and come to a compact and tidy Cree community, population 700, tucked onto the north shore of Champion Lake. For the first-time visitor, strolling along the town’s sandy footpaths or sitting at the base of a wind-shaped cedar tree, it is easy to feel at peace here. Poking your head into the town’s steamy, camp-style diner, you are met by the sound of young voices, mostly speaking Cree. 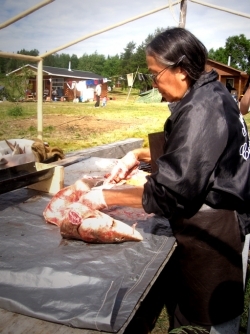 The name Nemaska derives from a Cree word meaning "plenty of fish," and even today, aside from administrative functions, hunting and fishing remain the economic lifeblood of the community. 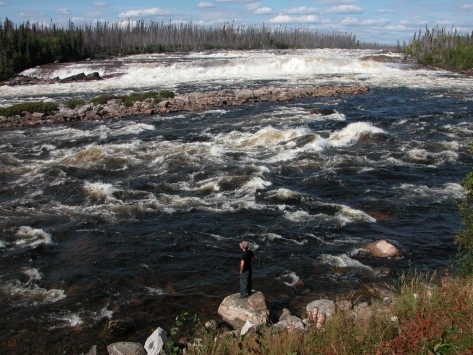 On the nearby Rupert River, world-class rapids create an oxygen-rich environment that is ideally suited to the growth of sturgeon and giant trout. A series of traplines, managed by extended families, cluster along the Rupert, which served as a conduit to the early fur trade. Cree settlement here, as evidenced by archaeology, goes back thousands of years. Still, for a more recent generation of Nemaska Cree, the Rupert has become synonymous not only with tranquility and abundance, but also with upheaval. Originally located at a site 60 kilometres downstream, the town of Nemaska was closed by government order in 1970 to make way for a hydro-electric project that was expected to flood the area. Following protests, the project was suspended, but now, almost four decades later, a new Hydro-Quebec initiative is underway to divert the majority of the Rupert's waters into a set of reservoirs along the La Grande River, in the north of Cree territory. When it is finished, in late 2009, the diversion will flood 640 square kilometres, reducing the area on 10 out of the 15 traplines belonging to Nemaska families. The once-mighty Rupert, up to a kilometre wide in places, will be reduced to a trickle. The new project will entail the construction of four dams, several dykes and a diversion channel. The Rupert seems fated to become the latest link in a network of projects that has altered the shape of free-flowing rivers in northwestern Quebec. In 1974, Hydro-Quebec started building the first in a series of dams along the La Grande River, which drains into James Bay. Throughout the 1980s, the diversion of two neighbouring rivers doubled the outflow of the La Grande and flooded an expanded area around the La Grande reservoirs. The project forced the relocation of the Cree community at Fort George (now Chisasibi), and was associated with a host of setbacks that included restrictions on fishing (due to mercury pollution), a change in weather patterns and a decline in waterfowl populations. Proponents of the development point to a 1975 compensation package, negotiated with the provincial and federal governments, which helped pay for the construction and maintenance of infrastructure in Cree villages. But many Cree feel that by flooding traplines, the hydro development undermined the prospects for a hunting-based economy, forcing young people away from what is still a nomadic lifestyle and into a sedentary and rootless existence on reservations with few prospects for employment. Each day, summer and winter, the Jolly family drinks tea brewed from the water of the Rupert River. A collection of storage jugs stashed beside the samovar in the kitchen attests to the fact that these Nemaska residents prefer the taste of fresh water to the tap variety. Freddy Jolly, a 53-year-old trapper, was my guide in Nemaska. Like many Cree of his generation, Jolly was born at his parents' bushcamp. Bushmeat remains a regular part of his diet and during spring goose season he spends a few weeks in a cabin on his family trapline. As we drove around the back roads near Nemaska, Jolly kept his gun at the ready. More than once he estimated for me his yearly catch in animals. He described his childhood, explained how to roast bear fat with blueberries, and tried, in halting language, to convey the pain he felt at losing the Rupert, which runs along his trapline and which he feels is part of his very self. To reach the northern reaches of Jolly's trapline today, you need to drive through a Hydro-Quebec checkpoint. You can have lunch, the way we did, at a workcamp built of prefab houses designed to accomodate 1,800 employees. While we were there, Jolly went to talk to a project manager about the burial sites of two of his older relatives, located near the area to be flooded. From the workcamp, you can continue for half an hour and park your vehicle at the end of a gravel road, keeping well back from the earth-moving machinery that is busy there. It will take you at least an hour to pick your way through the clearcut, a kilometre or three down to the isolated bush cabin that stands at the water's edge. When the area is ready to be flooded, the cabin, according to Jolly, will be dismantled and burned. Although Jolly opposes the diversion, last summer he accepted a contract from Hydro-Quebec to clear the spruce forest along this part of his trapline in advance of the flooding. I asked him how he felt about that. "Sometimes, after the work, tears would come out from my eyes," he said. "Seeing the trees being cut, seeing the trees being piled and burned. It was hard." The Rupert diversion was first mooted in 2001, when the Quebec government offered to provide funding for services that had been promised but not adequately delivered to the Cree communities. By tabling a "new relationship" agreement that included both the funding and the diversion, the province implicitly made one a condition for the other. The agreement, known as the Paix des Braves, won the support of Grand Chief Ted Moses, who campaigned in favour of it. Initially, a majority of Cree residents on eight out of nine reserves voted to support the settlement in a referendum. Nevertheless, for Cree residents in the affected communities of Nemaska, Waskaganish (located at the mouth of the Rupert; population: 2,200) and Chisasibi (population: 4,000), the diversion subsequently became the source of grave misgivings. 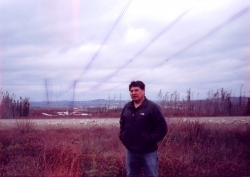 Speaking in June 2006, before an environmental review panel, the elected chiefs of these three communities criticized the plebiscite, arguing that since the vote was held three years before Hydro-Quebec issued its impact study, it could not provide a basis for informed consent. They noted that, during the referendum campaign, the Cree were told they were only approving studies on a potential diversion and were not being asked to give the go-ahead to the diversion, as such. "At the end of the day, the project...is one that creates unacceptable impacts on the natural environment," said the chiefs. "Unacceptable impacts on the species that are most important to the Cree way of life; unacceptable impacts on the material, social and spiritual lives of our communities; and the loss of one of the the most extraordinary free-flowing rivers in North America." The three chiefs promote the development of wind energy as a compromise that would allow Hydro-Quebec to generate electricity on Cree territory without destroying more of the traplines that sustain Cree culture. According to Hydro-Quebec, diverting the Rupert will add 893 megawatts (MW), or about 2.5 per cent, to the utility's power-generating capacity. But this figure represents less power than will be provided by wind energy once a series of new wind farms come online, starting in 2011. Since 2002, Hydro-Quebec has licensed private wind contractors to generate electricity and sell it to the utility's distribution branch at a pre-negotiated price. In 2005, the utility launched a new phase of its competitive bidding process to invite contracts that would total 2,000 MW. Regrettably, the proposals that were selected all involve wind farms in the south or southeast of the province. Among the unsuccessful bids was a proposal by Yudinn Energy, a Cree company based in Chisasibi, to build a wind farm near one of the existing reservoirs on the La Grande River. In an interview with The Dominion , a Hydro-Quebec spokesperson declined to specify the reason why the Yudinn project was rejected, citing confidentiality. Nevertheless, a cursory search on the utility's website shows that the projects that were approved were mostly small. Twelve of the 15 sites accepted projects at capacity of 150 MW or less, whereas the Yudinn farm, situated at a favourable location, would have produced 324 MW. For environmentalists and some Cree, it seems that the corporate culture at Hydro-Quebec remains biased against wind energy. In March 2007, an article by journalist Louis-Gilles Francoeur, writing for Montreal's Le Devoir newspaper, indicates that the province has a policy of not allowing wind power to exceed 10 per cent of the utility's generating capacity. This attitude is highly frustrating to those who see more hydro development as both socially and environmentally destructive. "We have unfortunately discovered that Hydro-Quebec is not a leader but a follower in this 21st-century industry. For many years, Hydro-Quebec has been discussing the difficulties of wind development, while others have been busy solving them." "The documents leave little doubt that Hydro-Quebec would simply rather dam another river than take on the challenge of harnessing the wind."